iSmartAlarm Doorfront™ alerts users when someone is at the door and allows remote monitoring and communication capabilities. Our Doorfront™ solution will allow the person on the go to stay connected to their homes no matter where they are and help ensure the safety and security of their homes, belongings and, most importantly, their loved ones. iSmart Alarm, Inc. today unveiled the iSmartAlarm Doorfront™, a new security and home control tool that alerts users via their smartphones when someone comes to the front door or rings the doorbell and allows them to see, hear and speak to their visitors whether they’re at home or not. With iSmartAlarm Doorfront™, users can remotely monitor entryway activity, keep an eye out for package deliveries, and be alerted to suspicious activity. The iSmartAlarm Doorfront™ will be available for pre-purchase in the first quarter of 2014. The iSmartAlarm Doorfront™ is the first device to seamlessly integrate motion detection, a high-resolution controllable camera, doorbell, and intercom functionalities in an easy to use device. The iSmartAlarm Doorfront™ provides a wide view of activity and notifies a user via an Android or iOS device if there is motion in range or if someone rings the doorbell. The user can then see who is at the door and can directly communicate with the visitor, view activity through the live streaming video and automatically or manually take snapshots of action and people. The iSmartAlarm Doorfront™ is weather-resistant, can either be wired to the pre-existing doorbell or used with batteries, and is theft-proof. The iSmartAlarm Doorfront™ compliments iSmart Alarm’s line of existing home control, security, and automation products. The Doorfront™ can also work independently as well. The iSmartAlarm Home Security System is the company’s flagship product, a self-monitored, self-controlled home security system with no monthly fees and no required contracts, emphasizing a 21st century spin on traditional security systems. The iSmartAlarm Home Security System is designed to be expandable, mobile, and DIY, with no wiring necessary. iSmart Alarm also recently introduced iSmartAlarm Smart Switch, which allows users complete control over their home’s lighting, appliances, security and electrical bill through their mobile devices. These products are all part of the iSmartAlarm home control ecosystem, offering users a new level of control and connectivity within their homes, allowing anyone to monitor, manage, and secure their home, property and family using their iPhone or Android devices. 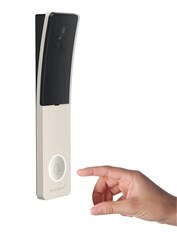 For more information on iSmartAlarm Doorfront™ and other iSmart Alarm offerings, visit http://www.ismartalarm.com. iSmart Alarm, Inc. was founded in Silicon Valley in 2012 on the principles of safety, beauty, and intelligence. They designed and developed the best smartphone-enabled home security and home control system. The iSmartAlarm puts a 21st century spin on traditional security systems. The sleek, sophisticated system utilizes Apple devices to put home security and home control in the palm of its users’ hands. Their products are cool, simple to use, and affordable to everyone. iSmartAlarm protects your home intelligently.